When Miles Jupp kicks off the 88th series of The News Quiz tonight he'll be the fifth chairman in the programme's 38-year history, following in the footsteps of Barry Norman, Barry Took, Simon Hoggart and Sandi Toksvig. In the mid-70s BBC national radio offered any number of general knowledge quizzes, from Brain of Britain and Top of the Form to Forces Chance and Town and Country Quiz but nothing with a current affairs slant. The idea for a quiz about the news was first pitched by Nicholas Parsons - himself no stranger to topical radio comedy after performing in Listen to this Space - to a young BBC comedy producer, one John Lloyd. A suggested team captain was Gyles Brandreth and the suggested title was Keep Taking the Tabloids. The notion of a topical quiz was not an entirely new one, BBC2 had already broadcast Quiz of the Week that Ned Sherrin had chaired some seven years previously. 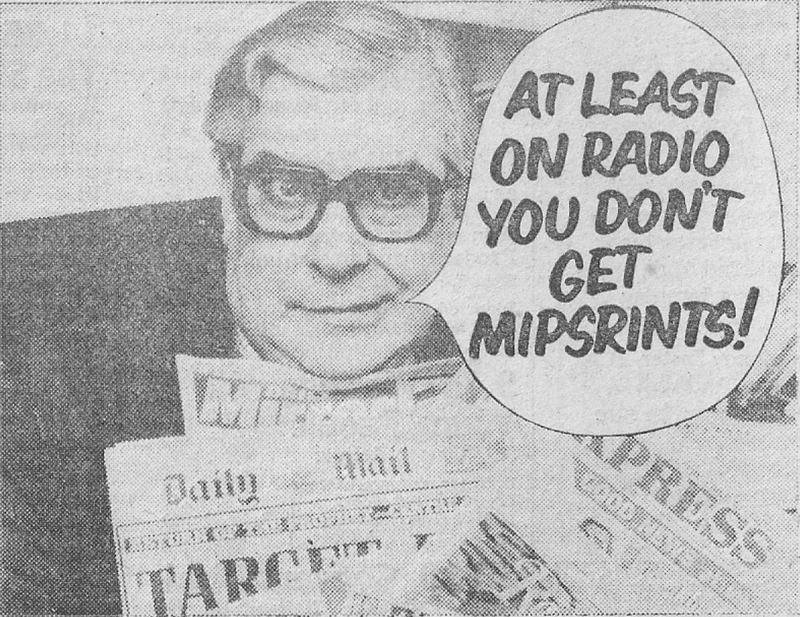 The only similarity between the two programmes would be the reliance on Private Eye team members; Richard Ingrams, John Wells and Willie Rushton appeared on the TV version with both Ingrams and Wells becoming regulars on the eventual radio incarnation. The pilot of Keep Taking the Tabloids was not a success. Lloyd reckoned that the news needed a serious title and a more serious approach. 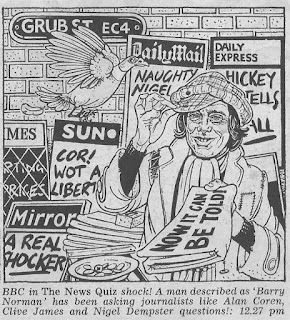 So on 1 April 1977 a new pilot, this time under the title of The News Quiz, was recorded. The panel consisted of Alan Coren - who would of course rise to be the show's star turn for the best part of three decades - Ingrams, Russell Davies and Nigel Dempster. The chairman was Barry Norman and the newsreader John Marsh. This is how it all sounded. Note the nod to Parson's original title which gets a deserved groan. 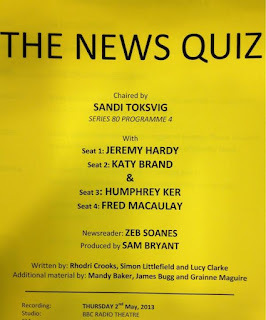 The News Quiz got the green light and the first edition aired on Radio 4 on Tuesday 6 September with the same participants as the pilot except for the substitution of Nigel Dempster for Clive James. You'll notice the first transmission date was a Tuesday, odd for a quiz about the week's news; but which week? It moved to a Saturday for the start of the second series in 1978 but didn't find its current Friday night 6.30 pm slot until major Radio 4 schedule changes were implemented in April 1998. The News Quiz was launched fully formed and required very little tweaking over the years: two teams of two with questions over three rounds. News cuttings read by a Radio 4 newsreader and panellists reading out their favourite news story at the end. And of course the sig tune of Leroy Anderson's The Typewriter. The only real change has been the gradual shift from the quiz format to an outright comedy format. Listen back to early editions and the majority of the panellists have a journalistic background. They sometimes scrabble around for an answer or, as was often the case with Richard Ingrams, totally fail to know anything about the news story. There was a no comedians rule which original co-producer (who had previously worked in the BBC's News Cuttings Library so was well-placed to look after the show) Danny Greenstone says was observed "because it would be too simple to simply populate the show with comedians, there were too many good ones around and we wanted The News Quiz to be very different and to stand out." They didn't want comics to "twist the news story to provide themselves a feed for the gag that they want to do". 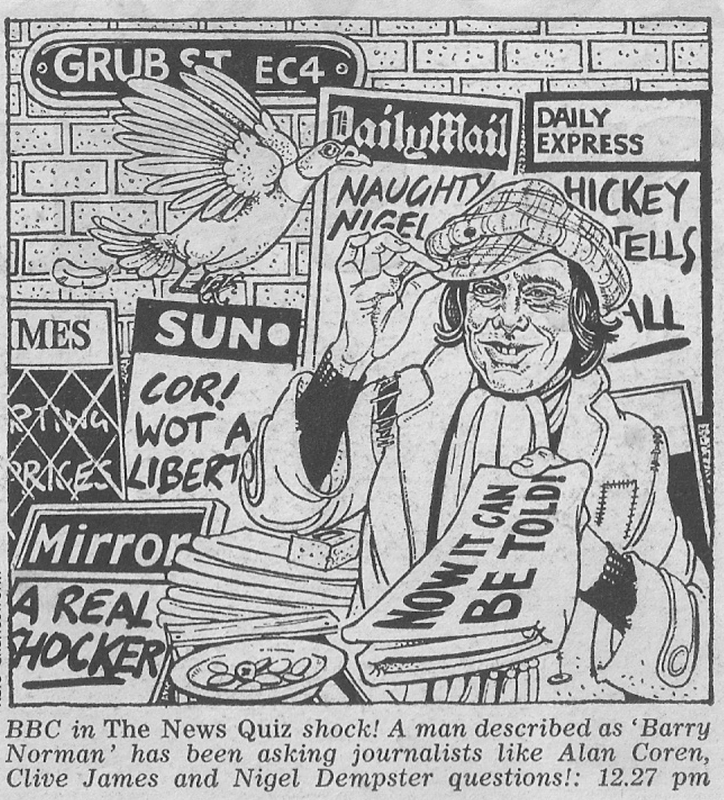 Certainly by the time that Barry Took succeeded Barry Norman in 1979 the show was already evolving with Took keen to ensure that panellists drew out the humour from the subject matter:"The joy of The News Quiz is that while the questions are not especially difficult for the working journalists on the team to answer, their reaction to the question and their way of answering it reflects in many ways their own individual journalistic style". 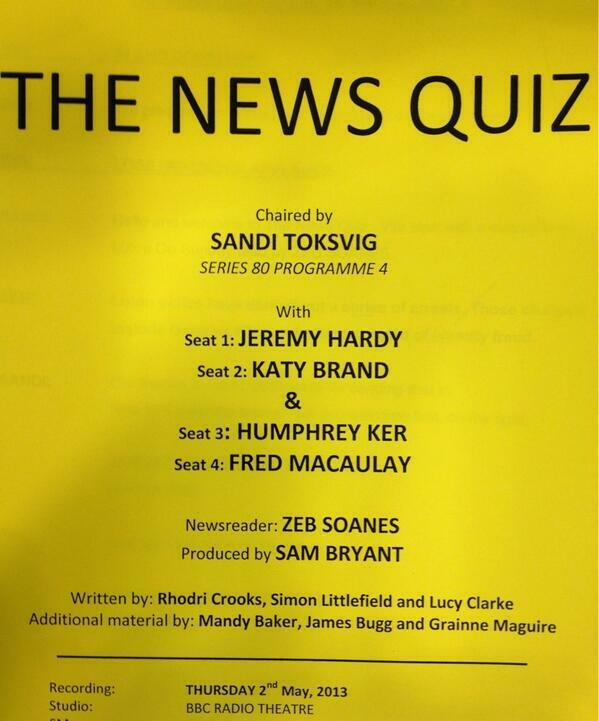 This edition of the programme is a News Quiz of the Year. The year in question is 1989. Taking part are Alan Coren, Richard Ingrams, John Wells and Kate Adie. In the chair is Barry Took, reading the headlines is Brian Perkins and the producer is Armando Iannucci. This recording was made on Saturday 23 December 1989. In 1990 former News Quiz producer Harry Thompson went off to BBC TV to produce the TV equivalent in Have I Got News For You? taking with him panellist Ian Hislop. It took the radio show another six or seven years before it regularly employed a resident comedy contributor with Jeremy Hardy and Andy Hamilton joining the rota. These two are now the longest-serving panellists, along with journalist Francis Wheen who first appeared in 1994. One of the show's constants is the use of the otherwise formal sounding Radio 4 newsreaders. Former newsreader Charlotte Green said that they "love to take part because the programme allows them to play the part of a court jester to the hilt, reading out comically surreal cuttings from the newspapers". One of Charlotte's favourites was: "Shoplifters are becoming ever more exotic in their choice of goods. In New York, light-fingered Sybil Serth was rushed to hospital with hypothermia, after concealing six frozen quails in her bra and four more in her knickers. 'My son must have put them there when I wasn't looking,' she later explained". 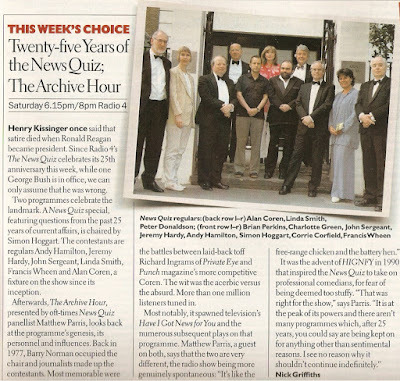 In 2002 The News Quiz celebrated its 25th anniversary with an extended edition of the programme and an edition of The Archive Hour presented by Matthew Parris titled Headlines, Deadline and Punchlines, You'll also hear contributions from John Lloyd, Danny Greenstone, Alan Coren, Richard Ingrams, Harry Thompson, Ian Hislop, Simon Hoggart, Roy Hattersley, Charles Kennedy, Jeremy Hardy, Lucy Armitage and Linda Smith. Outgoing News Quiz chair Sandi Toksvig talked about the shows evolution in 2008: “If you hear some of the early programmes, they’re not funny. People would be asked about a story, they’d answer and they’d get two points.” That same Daily Telegraph article explained that "purists will be happy to learn that the contestants get no prior warning of the questions. The wiser ones will prepare gags on the week’s events – but aren’t allowed to take anything written into the Thursday night recordings. Toksvig is equipped with one-liners from a team of writers, but relies on ad-libs for 'around 40 per cent' of her contributions. The producer then has to edit an hour and a quarter’s worth of material into 28 minutes. (Sharp-eared listeners will notice that this sometimes has strange effects on the already fairly arbitrary scoring system.)" 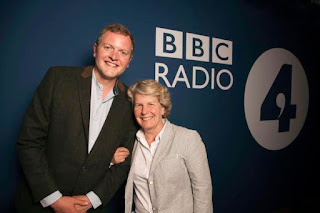 According to Toksvig, in a Radio Times interview earlier this year, the first thing she did when she took over as presenter in September 2006 was "to get rid of the person who kept score ... the listeners never heard her but she sat right in the middle between the host and the newsreader". She acknowledged that "it's not even a quiz. We never needed a scorer at all because the host makes the points up." 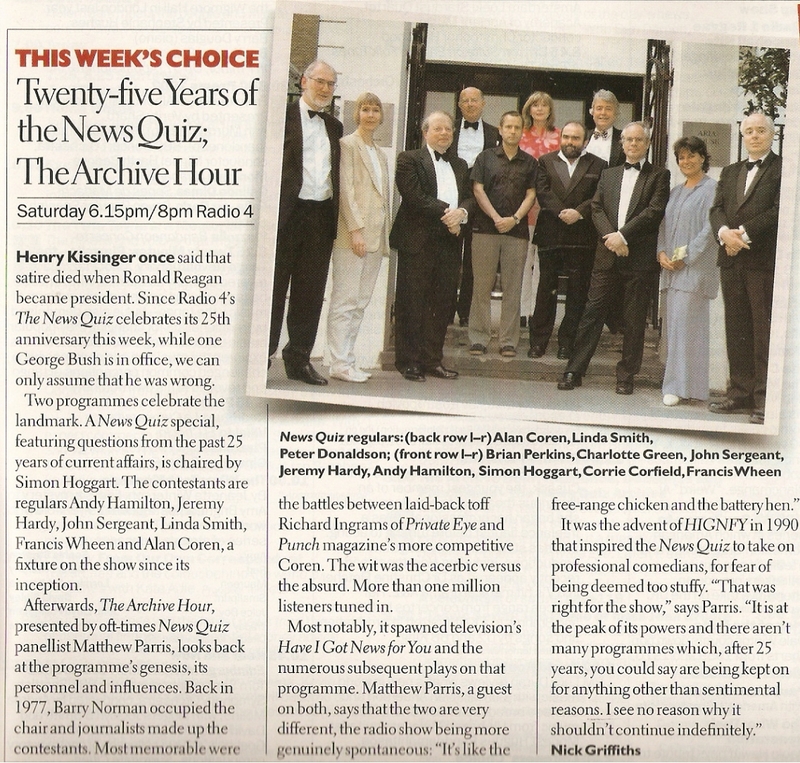 And finally a 2005 edition of the show chaired by Simon Hoggart with Alan Coren, Andy Hamilton, Fred MacAulay and the much missed Linda Smith. Reading the headlines is Charlotte Green. This programme aired on Friday 1 July 2005. Like Simon and Sandi before him, Miles is a poacher turned gamekeeper, moving from contestant to chairperson. Already he hopes to "tweak" the guest list, suggesting a return to a more mixed panel. "I would like to get some politicians on, particularly those who are capable of actual thought and speech. I want to make sure we keep having journalists on, too. They really go for the stories, whereas comedians tend to pick around the periphery of a news item and make jokes in the margin, which is valid. But journalists talk about the news stories in a way that makes them more accessible." As to how long he'll stay with The News Quiz, "it's open-ended", he told the Radio Times. "I'm just thinking about my first series, and doing the best job I can do, The news is different every week, so there's no reason why it can't feel fresh for quite a long time." Dedicated to Danny Greenstone who sadly died last month. The News Quiz did make an unsuccessful transition to TV as Scoop. Two series were broadcast on BBC2, the first in 1981 chaired by Barry Norman, the second in 1982 with Richard Stilgoe.